I truly love working with TLC Book Tours. I'm lucky to have been working with them for many years, and in doing so I've had the opportunity to review some wonderful books I might otherwise not have picked up. My Thinning Years is one of those great reads. Honestly, I was approached about possibly reading this book because I had already read and reviewed Sweet Tooth, another memoir type story from a man who battled his sexuality at an early age. And while I enjoyed that book, this is just a whole other type of read. Honestly, you can't (and I shouldn't) compare the two. These men had their own stories and their own challenges over the years. Let me introduce you to Jon Derek Croteau. Jon is a really incredible writer. The way he shared his story - his battle with himself - his body - his mind - his father - his heart - my goodness. It was phenomenal. Intense. Real. Raw. Heartbreaking. This story isn't just about being gay, though. And part of what drew me to it was the eating disorder(s) Jon experienced over his lifetime. Jon worked hard at getting thin. Trying to be less fat. Less fat when he wasn't truly fat to begin with. He worked to the point of starving himself. He counted, tracked, and ensured that nothing evil passed his lips. He ran. Like a fiend. He ran, and ran, and ran some more. My heart broke as I read the life he lived. The experiences he suffered through as he hated himself so much because he either thought he could be gay or because of how his father treated him. His father was abusive. Plain and simple. I wished his dad would go away. I wished he could escape. I wished his mom, his siblings, I wanted them away from the way his dad spoke to them. I watched, as an outside, as Jon would find himself in his room with no dinner. And ached when I read the thoughts of this young man. A young man thinking he deserved that. And then I watched as he finally escaped. I won't tell you how that all went down - you'll need to read for yourself. But eventually it did. He still beat himself up for a long time. He still battled an eating disorder and his sexuality. Eventually, though, Jon became someone he felt was worth knowing. Someone he felt was worth loving. And I'm so glad he did. 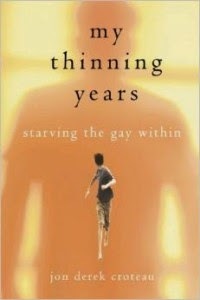 My Thinning Years is available on Amazon and is absolutely worth a read. Absolutely. I'm also giving away a copy to one of my readers. I'm not asking for much, just a comment saying you want to read this book. And if you're inclined to tweet about it count that as an extra entry and leave me the URL. Easy peasy. US/Canada readers only. Sorry - everyone else - it's not my rule. You should still buy the book. It's worth it. Promise. This sounds like an incredible read, especially given the moment we are living in! Thanks for the poignant review, Andrea! Great book review----my heart goes out to the young man.